I had mentioned in my last post that one of India’s best-known metal bands Undying Inc would be performing in our city. They did and the show was awesome! And it was such a pleasure to have them here in our house. It was a short stay but the days simply flew. It was a joy to cook for them and to interact with them. I’m glad my son is the drummer of this extremely talented band. This picture was taken outside our front door just before they left for the airport. Back row, from left: Biswarup (guitars) & Reuben (bass). Front row: Shashank (vocals), Nishant (my son on drums)& Angshuman (the sound engineer). There’s no recipe in this post but I’m including some of the pictures of the desserts I made when they were here. All of them were with apples. 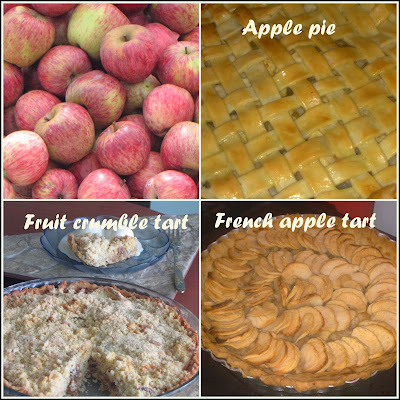 I have often mentioned that we get very acidic fruits in our region so when it comes to baking pies and tarts, it’s safer to stick with apples. Everybody loved them and it helped that apples are a hit with all. As for the mains, it was rice, dal accompanied with a meat or fish dish, salad, and a baked or fried vegetable dish. I had recently got the book Baking With Julia by Dorie Greenspan and I decided to make the French Apple Tart from there. What a pleasure to create something simple but looked so exotic with the concentric circles of sweet apples. The other desserts I made were the usual apple pie and a crumble tart where I added apples, a couple of star fruits, dried currants, and some rum-soaked raisins. Whereas the first two desserts were served with cream, the last one was served with vanilla ice-cream. To see the boys going for seconds was absolutely worth it!! You can see what they wrote here on their Facebook page. Thank you so much for stopping by today. And for the new likes on my Facebook page!